The card: Diminutive, with a product photo on one side and pertinent info on the other, including a stylized circle logo. The backstory: When Linsey moved from Seattle to New Orleans three years ago for her husband’s medical residency, she kept her job at Microsoft and commuted to the West Coast. It was stressful, and her skin “freaked out.” She began experimenting with skin tonics using essential oils and natural ingredients not unlike those her parents had grown up with as former Fiji islanders. Friends began asking for her wares, and a skincare company was born. 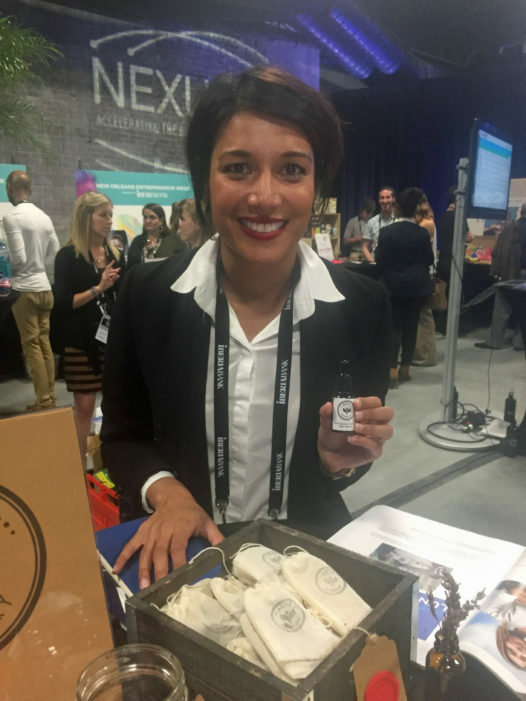 The company launched last year with an anti-aging lavender face serum. The backstory: The 5-year-old company replaces any paper ticket with a digital version that tracks workflow, revenue, job dispatch and the like. It began with the New Orleans tug and tow crowd and has since branched out into other areas. “Our niche is that we can do any type of paper ticket,” says Rick. The logo: “It’s a combination of clarity and logistics, with a little word play.” The blue square behind the “tix” highlights the digital product.